Last week, an unofficial (and buggy) Android 5.0 Lollipop build landed on one of the largest devices that can be regarded as a "phone" - the 6.4" Sony Xperia Z Ultra. The firmware in question was nothing else but a port of yet another unofficial Lollipop build intended for the smaller-sized cousin of the Xperia Z Ultra, the Xperia Z1. Well, it seems that those who are rocking the Google Play edition of the Sony Xperia Z Ultra can now finally rest, as their device of choice is reportedly receiving Android 5.0 Lollipop over the air as we speak. 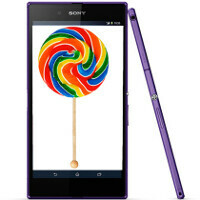 This makes the Xperia Z Ultra GPe one of the first Google Play edition devices to officially receive Lollipop. In the meantime, HTC's Google Play edition devices, the One (M7) and One (M8), are still in the queue line, while Samsung's Galaxy S4 GPe with Lollipop aboard got caught in the wild just yesterday. Weighing in at 397MB, the update will turn your KitKat-toting Xperia Z Ultra behemoth into a Lollipop one. Apart from the most noticeable difference - the Material Design interface overhaul - the update also dons revamped lockscreen notifications, improved battery saving mode, better performance, improved security, and a number of other features that made debut alongside the newest Android. As usual, the rollout is staged, which means that you might or might not be among the first wave of users to get closer to getting diabetes with the new sweet Android. If you're impatient, it probably won't hurt you to head on to Settings and hit that "Check for software updates" option, will it?